Waterford — Jocelynn Neri and her high school-aged younger sister Bridget have been a staple at the Wednesday evening concerts at Waterford Beach this summer, as well as at the farmers market Saturday mornings next to Town Hall, selling coffee and sweets from a nicely decked-out food truck with pastry displays, wood paneling and attention-getting lights. To some, the cool Coast Coffee truck, homemade treats and specialty coffees might seem like a summer lark. But Neri, 27, is deadly serious about developing a culinary business in the area, and said she has been testing the waters by talking to customers and trying out recipes from her 1976 Citroen HY van that she found online and imported from the United Kingdom. "I come from a long line of entrepreneurs," she said. A graduate of Mercy High School in Middletown, Neri said she attended the Culinary Institute of America in Hudson, N.Y., then worked at a fine food establishment in the Washington, D.C., area before deciding that the restaurant life wasn't for her. Instead, she felt drawn to the chatter and camaraderie of coffee shops, eventually developing a skill similar to a sommelier thanks to her attendance at frequent coffee tastings. She later became editor in chief of the Culinary Institute newspaper, she said, writing about coffee and other food businesses, while also learning people skills and networking. Starting in 2013, she worked for Lyme-based Ashlawn Farm Coffee, opening up as the Old Saybrook location's first manager before moving onto Sift Bakery in Mystic for two years, where she learned new skills in food preparation and management from owner Adam Young, recently named during a Food Network series as Best Baker in America. "I learned an insurmountable amount of information from him about starting a business," Neri said. "There was no sugar coating with him." 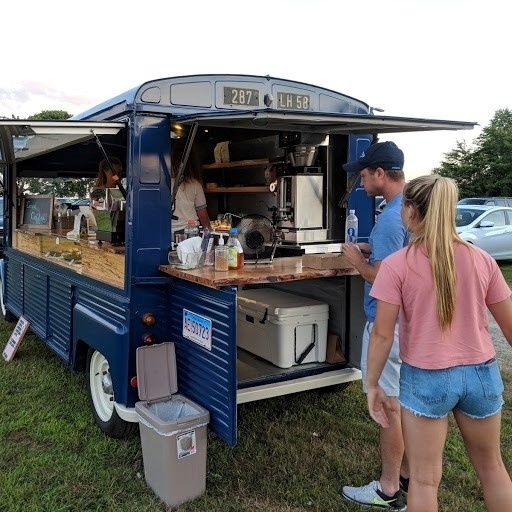 Neri said she knows Connecticut is a tough place to start a business, which is why she wanted to start small with a food truck rather than plunging immediately into operating a coffee shop or bakery. So far, her truck can be seen regularly at only the two Waterford events and from 10 a.m. to 1 p.m. Fridays at Grace boutique in Niantic. It also has been seen at special events such as Celebrate East Lyme and the recent Fireman's Fair in Waterford. The petite truck turns heads wherever Neri goes, with its unusual European profile and custom-made interior. Neri said much of the truck's special retrofitting was accomplished thanks to boyfriend Gordon Adams, who works for Adams Builders. Inside the truck, Neri is assisted by her sister Bridget, 17, in doling out two brands of New England-roasted coffee, one under the Gib brand in Canton and the other Little Wolf in Ipswich, Mass. The next goal, she said, is to roast her own coffee, which she hopes to accomplish within two years. Meanwhile, she has been working on creating sweets from a commercial kitchen in Waterford, tweaking recipes for banana bread, roasted peach muffins and blueberry scones, among others. "People come for the coffee, but they also want good pastry with the cup of coffee," she said. Some of her sweets are allergen-friendly and cater to other dietary restrictions, but she wants her baking to encompass a wide range of palates. "There's a lot of heart behind it," she said. Her truck also sells a variety of frappes, fresh-squeezed lemonade and watermelon lemonade. In the fall, she plans to experiment with some pumpkin-spiced lattes and other seasonal recipes, perhaps showing up at local farmstands on a regular basis. Neri, whose parents own Old Colony Construction, said she is unsure what to do for work during the colder months, but plans to be back next summer with her coffee truck. For inspiration, she recalls the story of famed restaurateur Thomas Keller, whose first restaurant failed. "I've failed a million times," she said, encouraging young entrepreneurs to be brave as they attempt to create new businesses. "That's what defines if you're going to make it or not — if you get up."